Rescuers search at the scene of an Ethiopian Airlines flight that crashed shortly after takeoff. 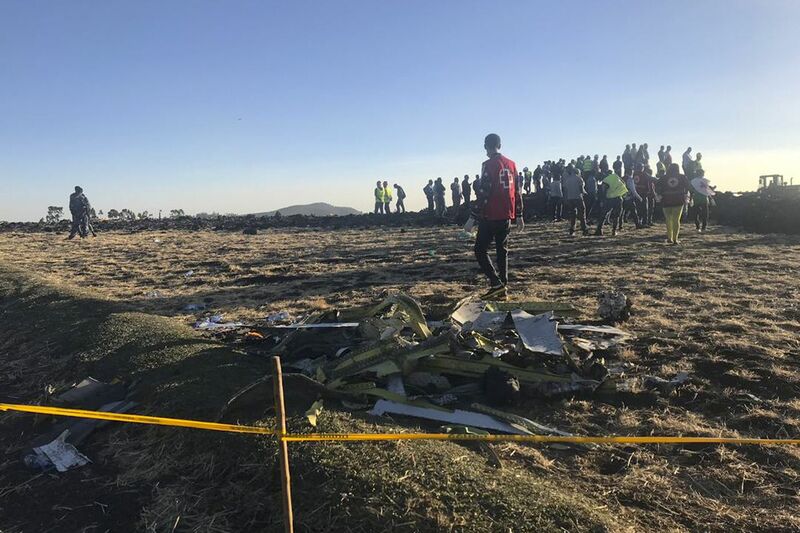 A man with ties to South Jersey was aboard the Ethiopian Airlines flight on which dozens of passengers died in a crash Sunday shortly after its departure from Addis Ababa, Ethiopia, for Kenya. Matt Vecere grew up in Sea Isle City before moving to California, according to his online profiles and multiple news outlets. He worked for IQAir, an environmental technology company headquartered in Switzerland, the company said. Vecere, 43, helped earthquake victims in Haiti, according to NJ.com. He studied at the Florida Institute of Technology and later transferred to Stockton University before moving to the West Coast in 2005, according to his personal website. Vecere attended Stockton from 1998 to 2002 and majored in biology, according to a university spokesperson. The school was “saddened to hear” of his death, the spokesperson said. One of his Stockton instructors, biology professor Margaret E. Lewis, recalled her former student as kind and passionate. On his website, Vecere also reflected on “working for his parents at various ranches and restaurants” in South Jersey, where he learned how to surf. While a student at Stockton, Vecere wrote, the author Mimi Schwartz was a mentor to him. Some took to social media to reflect on their relationships with Vecere. “Matt Vecere as I fly over New Jersey where we met 15 years ago I have learned of your passing,” one post on Twitter read. “I gaze at this sunrise and star, and I reflected that you will always be a beacon of light and freedom. Miss you brother until Valhalla, fair winds and following seas. #ET302." The Ethiopian Airlines flight bound for Nairobi was carrying 157 people when it crashed six minutes after takeoff, leaving no survivors. The victims came from 35 countries, according to the Associated Press. Many questions about the crash remain, and some airlines and regulators are grounding the Boeing plane model at the center of the incident as officials search for answers. Just a handful of 737 MAX 8 jets have been arriving at or departing from Philadelphia International Airport.